Loud and fun or classic and understated, charm bracelets have long been loved for their playfulness and ease of wear, with individual charms often capturing a memory or kept as a lucky talisman. Everyone from Queen Victoria to Elizabeth Taylor and Leandra Medine has rocked them, and it’s not difficult to see why. Easily customisable, charm bracelets make for a unique piece of jewellery that can be switched up according to mood, and designed such that each wearer can create their own unique piece. Whilst Pandora and Tiffany & Co. have long been frontrunners of the trend, we put together a list that strays a little away from the mainstream, to create a selection that is fresh and fun, whether you love a host of chunky charms or a string of subtle bling. Whilst Louis Vuitton is most famously known for its leather goods, the French fashion brand also makes a vast selection of charms that can be purchased individually and attached to a white, pink, or yellow gold bracelet. The imaginative collection leaves no luxury spared with an array of precious pieces ranging from a diamond and ruby encrusted hot air balloon to a miniature lapis lazuli Louis Vuitton Alma bag. 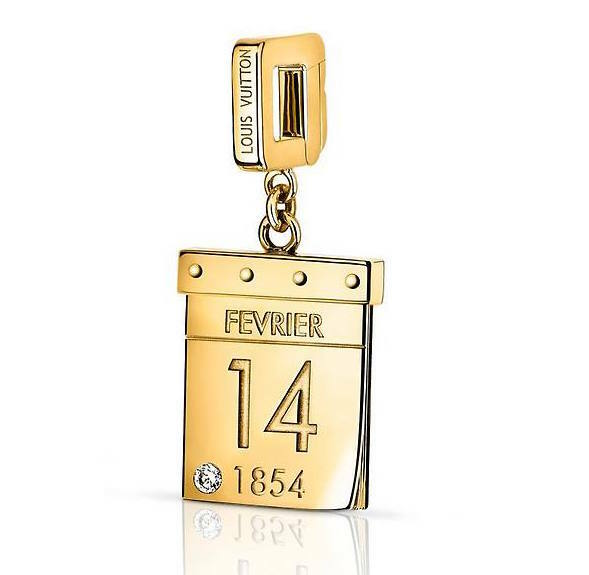 The standout charm is definitely the Calendrier Love Charm, which can be engraved in the front with a date of your choosing — an extremely endearing way to remember a special day or occasion. Delicate and colourful, British fine jewelry brand Loquet London is a dream for charm bracelet lovers. Aiming to allow owners to tell their own story through an accessory, the brand provides clients with the option of a bespoke service, in order to create an entirely unique piece. For those who can’t quite settle on a particular motif, Loquet also offers a selection of pre-designed charm bracelets. 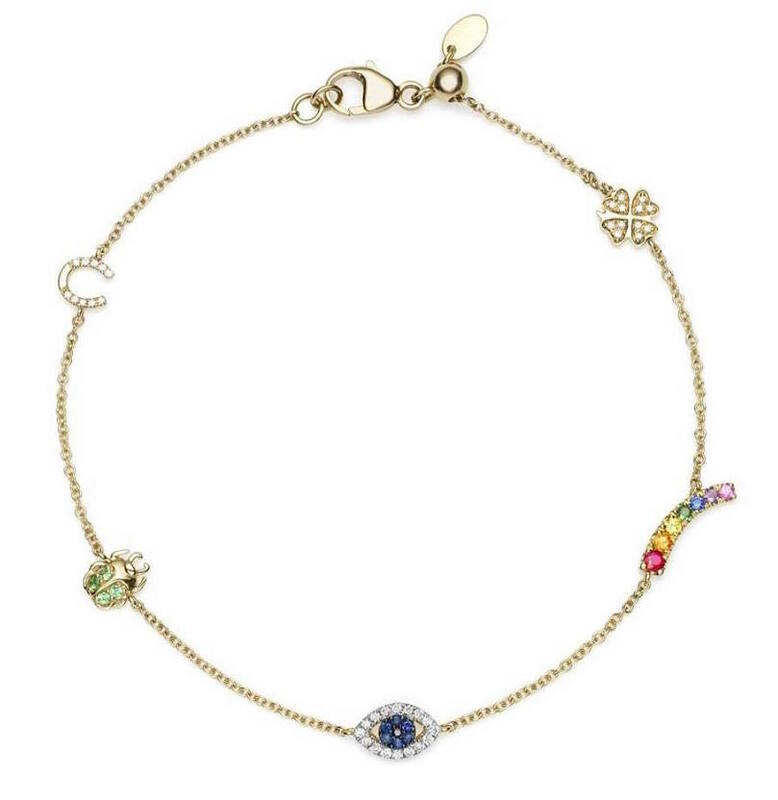 The Luck Charm Bracelet is a vibrant example, featuring a clover, rainbow, evil eye, beetle, and horseshoe charm in sparkling white diamonds and multi-coloured sapphires on a 14k gold chain. Perfectly in tune with the young and creative spirit of the brand, this bracelet can be worn alone or stacked with others. Consider it a fun arm candy piece to wear on a tropical vacation, or back at work as a colourful memory of holidays past. For those who want the dazzling dangle of a charm bracelet without the decision-making involved, Chopard provides an elegant option. Part of the Swiss luxury brand’s iconic Happy Diamonds collection, the Happy Dreams bracelet is a light and joyful interpretation of a refined charm bracelet. 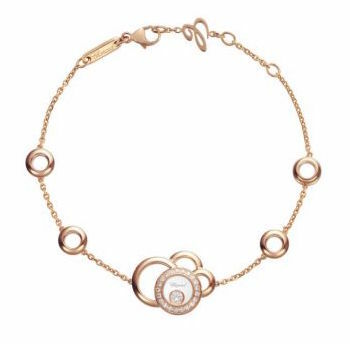 It features four 18-carat rose gold circles of different sizes with a diamond-set leading circle at its centre, designed to resemble a floating cloud in the sky. An exquisite cloud indeed, the central pirouetting mobile diamond is definitely the star of this piece, adding a gently jovial touch to a bracelet suitable for everyday wear. 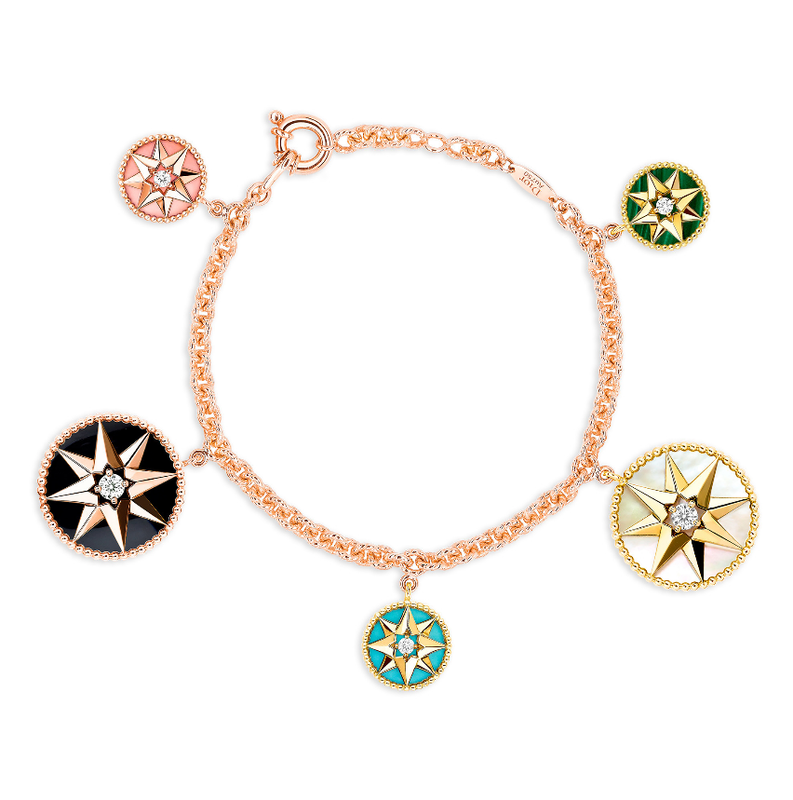 Bringing sharp snaps of colour to the wrist, the Dior Rose des Vents bracelet features a reinterpretation of Monsieur Dior’s lucky star on five colourful permanent charms. Each of the medallions holds a different gemstone, all encircled by a twist of grains and a diamond at the centre. From the deep onyx to the shimmering mother-of-pearl, this 18k pink and yellow gold bracelet appears delicate enough to be worn everyday, yet dynamic enough to make a statement. Celebrating diversity of colour and stone, each element complements the other, making for a charm bracelet that is urbane without being boring. Playing into the vintage feel that charm bracelets often hold about them, the Charm Collection by CVC Stones is a trendy alternative for those looking for unique stones in unique style. Created in collaboration with the amazing Leandra Medine, charms can be purchased individually and hooked onto an 18k yellow gold bracelet or necklace. Whilst the calming hues of pink and blue sapphires may look unsuspecting, the stones are actually already beginning to sell out, regardless of their upward of ฿30,000-a-stone price tag. 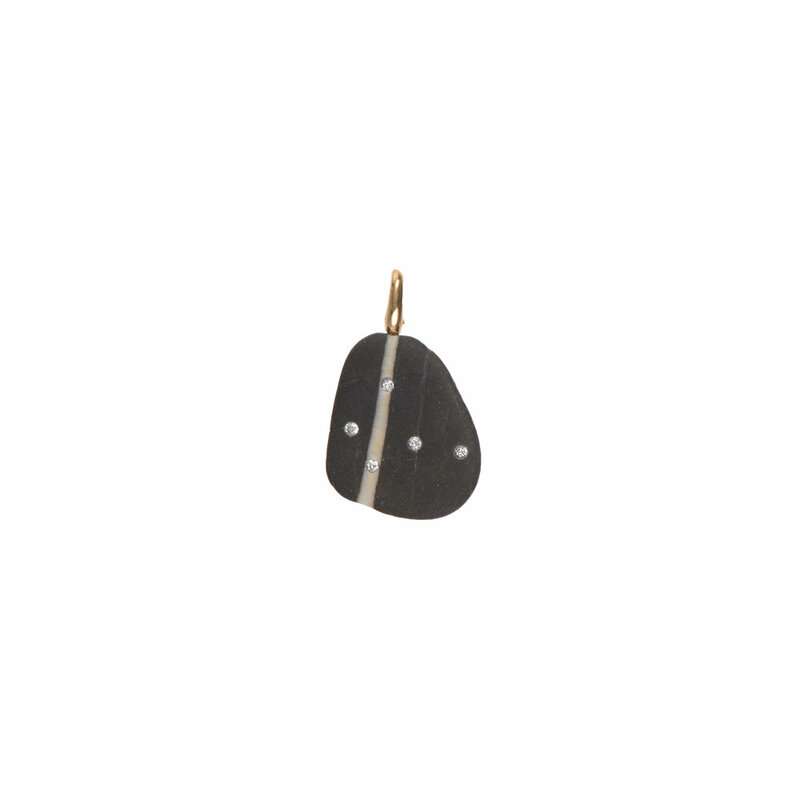 Whether you create a bracelet using all the same stones, or handpick a rainbow selection of your choice, this CVC Stones bracelet enables wearers to tell a story without being too literal. After all, a charm bracelet is all about what you make of it.